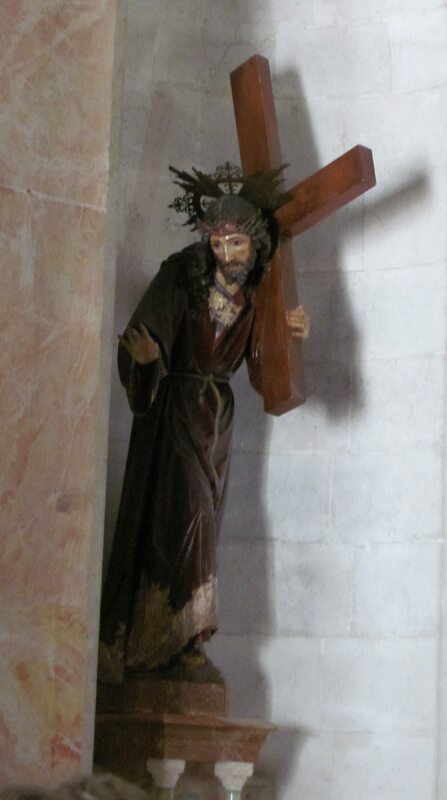 Sculpture of Jesus with the cross in the Chapel of the Flagellation, on the Via Dolorosa in Jerusalem. “Crucify him! Crucify him!” I shouted with the crowd. People surged forward towards the Roman soldiers holding Jesus, crying “crucify him!” – whipping the crowd into a standing frenzy. We were the crowd in Jerusalem, and we wanted blood. How easily my teenage self stepped into the part, swept up into the spectacle, something like a scene of out of Lord of the Flies! It was many years ago, but the scene is fresh in my memory. A Passion Play in an open air stone amplitheatre in Florida. Surrounded by palm trees, a warm breeze, dark sky studded with stars, actors dressed in first century costumes and sandals. Jesus whipped and bleeding. Then Jesus crucified in a flash of brilliant bright light suddenly extinguished, dropping us into black night with a clap of thunder. Each time I read the passion I re-live that night. My gut remembers being horrified at what I was shouting, frightened at how easily I was swept along with the crowd demanding blood. I hope, I pray, that I would have the courage to do the right thing and stand up against the mob in real life. But if there was danger and violence, if I was truly afraid, I think it is more likely that I would step away. Maybe I would say a silent prayer and disappear into the shadows, just like most of the disciples. And, in my apologetic silence, would I be whispering “crucify him” all over again?